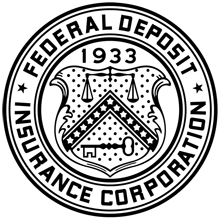 The Federal Deposit Insurance Corporation (FDIC) forms a critical part of the infrastructure of the US banking system. The FDIC issues an insurance policy which all regulated banks are required to purchase. This policy insures all of the bank’s depositors against default of the bank. If the bank fails, the individual depositors will be able to still get their money bank through the insurance policy. The current FDIC Insurance limit is $250,000 for individual accounts. So if a person has funds up to that amount, they will be able to recover everything they have been saving. What types of accounts does FDIC Insurance Cover? FDIC Insurance only covers extremely safe accounts in government regulated institutions. Banks that can and must purchase this insurance are subject to additional regulations but are also blessed with the appearance of much higher safety and security. In general, checking, savings, trust and money market deposit accounts, individual retirement accounts (IRAs), and certificates of deposits are covered by FDIC insurance. Each institution will have products that offer different rates of return and they will stipulate whether they are covered by FDIC insurance. Generally, those with insurance will provide a lower rate of return. Those interested in investing in corporate bonds, stocks, mutual funds, life insurance, sovereign bonds including US bonds, or other non-guaranteed investments should be willing to accept the higher risk in exchange for the higher potential reward. However, they should remember the federal government will not be there if the investment fails. Some people are under the impression that if they have $250,000 in a checking account and $250,000 in a savings account at the same bank, they will be fully covered. However, this is not the case. In fact, the $250,000 amount applies to all the accounts at one bank. An individual with $250,000 at Bank A and $250,000 at Bank B would be fully covered. Why is FDIC Insurance Important? Despite what some believe, the bank does not hold all of your money. In fact, it typically lends out a high portion of it, up to 80 or 90%. If everyone demanded all of their money back at the same time, the bank would be incapable of paying it and it would go bankrupt. Fortunately, this does not happen due to FDIC insurance. People know their money is safe even if the bank gets into fiscal trouble. However, during the depression of the 1930s, people became increasingly worried that their bank would go bankrupt and they would lose all of their money. Banks with a lot of bad debt have a high risk of defaulting and wiping out all of their depositor’s savings. During the depression, banks experienced a “run” on the banks where everyone did in fact demand their money for fear that they would be the last person not to get all of their savings back. With the implementation of FDIC insurance in 1934, bank runs became a thing of the past as people realized the government would guarantee their savings in the case of a bank failure. The insurance limit recently increased from $100,000 all the way to the current $250,000 in response to the 2008 financial crisis. During that time, many hundreds of banks across the US failed and FDIC Insurance was required to make good on all of the depositors’ accounts. In 2008, the financial system experienced a great shock when the housing market turned upside down. Without FDIC Insurance, the crisis would surely have been much worse. The policy forms a key component of the US financial system and will continue to be important to mitigate the damage of any future crisis.